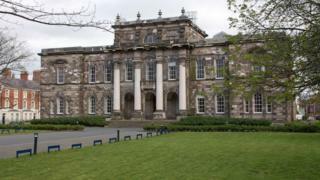 Queen's University in Belfast (QUB) is to formally end its link with the Presbyterian-run Union Theological College (UTC). The university's governing body - the senate - approved the move on Tuesday. The teaching arrangement between the two institutions has been in place since 1927. Queen's had previously decided not to admit any new theology students in 2019. That followed two separate university reviews in 2016 and 2018, which had raised a number of concerns about UTC. A further university review, carried out in recent months, recommended that the awarding of theology degrees by Queen's should end. With regard to UTC, it said: "Serious concerns remain unresolved and are contributing to an increasingly unsustainable and unsatisfactory position. "It is recommended that the university disengage from the current arrangement for the delivery of theology. "All undergraduate and postgraduate programmes in theology should be withdrawn and no further intake of students should be permitted." It concluded that the collaboration with UTC should be "discontinued". The senate has approved the recommendations in that review. However, arrangements will be made to ensure that current Queen's theology students will continue be taught at UTC until they complete their course of study. UTC is the only affiliated college to teach Queen's undergraduate theology students and also teaches a number of postgraduates. However, a small number of Queen's students are also taking postgraduate degrees through Edgehill Theological College, the Irish Baptist College and Belfast Bible College. The university's link to those colleges is also set to end once those students complete their degrees. Aspects of religion will in future be taught within Queen's departments like English, history, sociology, politics and philosophy. The university's pro-vice chancellor Prof Richard English said Queen's had taken the decision due to concerns raised over a number of years. "This was about the diversity and breadth of curriculum and it was about the range of opinions that people were exposed to," he said. "We've taken the decision that having tried to work with UTC to get a more flexible curriculum, we feel they haven't been able to deliver that. "So to be fair to our students and to the integrity of education Queen's has decided now to desist from that connection." Prof English said it was "regrettable" that degrees in theology at Queen's would therefore end. "We would rather it had been possible to deliver a more inclusive curriculum through UTC but that wasn't something they were prepared to do," he said. He added: "Religious subjects are still going to be studied at Queen's. "It should also be recognised that not all subjects are available to students in Northern Ireland. "People training as vets can't do so in Northern Ireland and while it's regrettable that theology won't be available I fear it's just unavoidable at this stage in time." Reverend Trevor Gribben, the clerk of the General Assembly and General Secretary of the Presbyterian Church in Ireland, said he deeply regretted the university's decision. "We regret that other options were not more fully explored and a different solution found," he said. "Union continues to maintain the high academic standards for which it is known and remains committed to active engagement in teaching and research that extends our theological understanding of important issues in contemporary life. "Along with QUB, Union College is also committed to ensure the very best education provision for existing Queen's undergraduate students as they complete the remainder of their theological studies. "The college will be working constructively with Queen's to achieve this. "After such a long and fruitful relationship, this is indeed a sad day."